Dr. J. Richard Chase, sixth president of Wheaton College, recently passed away at age 79. He was a college president for nearly a quarter century at Biola University & Wheaton College combined. 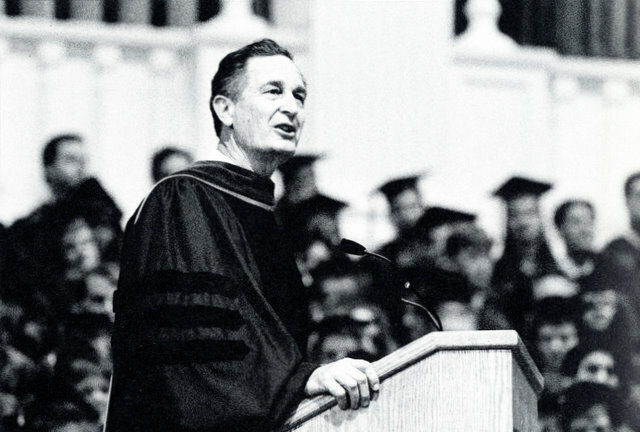 Two years after his retirement, the President Emeritus returned to Wheaton and gave the 136th Undergraduate Commencement address on May 7, 1995. His message (excerpted below) was entitled “Love the Lord Your God.” He is introduced by his successor, Duane Litfin. Graduates, the upheavals of change-experienced by people throughout time–are sure to swirl about you for as long as you live on the earth. The challenge to think and act Christianly today is tough, It is tough here in Wheaton, and, I suspect, far tougher in Burundi, Bosnia, and the barrios of the world. Society has never been an ideal cocoon for moral living: righteous living has never been the art of riding on society’s coattails. It has ever required a commitment to a guiding principle or foundation and the resolve to act responsibly. You may pick a time in ages past when you could travel with a “supportive” crowd in a “supportive” society, but true, righteous living is a matter of the heart, not a herd instinct. A Pharisee, a teacher of the Law, asked Jesus, “Teacher, which is the greatest commandment in the Law?” (Matthew 22:36). The Pharisee’s predicament was not much different from that of modern man. He was caught in the turmoil of both his foundation for life and his career. In a matter of months, Jesus had turned this Pharisee’s world upside down. His conversation with Jesus and our Lord’s response, “You are not far from the kingdom of God” (Mark 12:34), suggest that he was agonizing in mind and soul. There he was, caught between his past occupation and pattern of life and a new, revolutionary way of trust, faith, and commitment. And this is to say nothing of the oppressive Roman rule under which he lived, and, as a religious leader, of the accommodations he had to make with the ruling officials to hold his position. He approached Jesus with a question to test him. Although this Pharisee wanted to put Jesus on the spot, he was curious. I suspect he wondered, Could this man Jesus, who answered the Herodians and Sadducees so powerfully, help me? He asked, “Of all the commandments, which is the most important?” (v. 28). And Jesus responded, “Love the Lord your God with all your heart and with all your soul and with all your mind and with all your strength. The second is this: Love your neighbor as yourself” (vv. 30-31). Living effectively and righteously is never easy. But our Lord’s brief response gives us a place to stand. Here is a foundation that helped Daniel in Babylon, Deborah the prophetess as she led Israel against the Canaanites, Wilberforce as he stood against the slave traders, and countless numbers of God’s people in every age. This commandment tells us to love the Lord and our neighbors with such passion that it can invigorate our minds, direct our actions, and enrich our souls. It provides an overpowering focus for lives cluttered with competing goals and distracting desires. Further, it is as valid and all encompassing today as it was twenty centuries ago. My gift to you on this commencement day is but a reminder that Wheaton has brought you in contact with faculty who have informed, badgered, prodded, encouraged, guided, and yes, even graded you, in an attempt to equip you for a life of thinking. Think as you paint, play, perform, and counsel; think as you assist, reach, pray, relate, react, grieve; and think as you play and as you rejoice. Think within the context of an all-consuming love for our God and our world of neighbors.